Leading and up-and-coming scientists and science writers cast their minds one million years into the future to imagine the fate of the human and/or extraterrestrial galaxy. 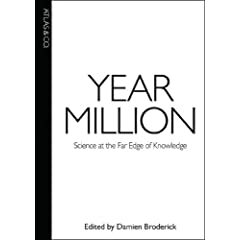 This volume of fourteen new, specially commissioned essays by notable journalists and scholars such as Rudy Rucker, Jim Holt, and Gregory Benford presents a series of speculations on the most radical but well-grounded ideas they can conceive, projecting the universe as it might be in the year 1,000,000 A.D. Their collective effort—first attempted by H. G. Wells in his 1893 essay “The Man of the Year Million”—is an exploration into a barely conceivable distant future, where the authors confront far-flung possibilities, at times bordering on philosophy of science. How would the galaxy look if it were redesigned for optimal energy use and maximized intelligence? What is a universe bereft of stars? Contributors include Amara D. Angelica, Catherine Asaro, Gregory Benford, Robert Bradbury, Sean M. Carroll, Anne Corwin, Dougal Dixon, Robin Hanson, Steven B. Harris, Jim Holt, Lisa Kaltenegger, Wil McCarthy, Rudy Rucker, Pamela Sargent, and George Zebrowski.